Paques01 (Photo credit: Wikipedia)Are your kids cooped up all week, bound by the constraints of a typical working family? Come the weekend are you just so glad to have some downtime for yourself you might forget that they need outside diversions? Ok, no more excuses. The better weather has arrived and it is past time to get the kids off the sofa, away from video games and head for the outdoors. Your family activities do not have to cost a lot, nor do they require an all day time investment. One of the things that a family can do together is run. 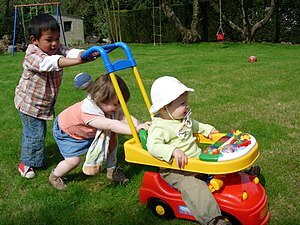 There may need to be a little pace adjustment for the small ones, or a stroller may be required for the tiny tots. Beg one, borrow one or ask to be gifted with one and then hit the paths. Everyone will enjoy this family outing and the fresh air. If you have trouble motivating yourself go to this website and see how they break it down in tiny easy to accomplish steps. Your kids will love you for it. No denying it childhood obesity is skyrocketing. This means earlier onset of foot and ankle problems due to the added stress and weight bearing on the young undeveloped bones of children. Don’t allow your child to suffer a lifetime of pain and aggravation when the solution lies right at your feet. Kids won’t make this decision by themselves. They need a leader who will set an example. No doubt about it, at first a change in lifestyle may come with some mild inconveniences, but overcome them now and set your kids up for success later in life. Build the strong feet and ankles necessary to carry them through life. Start your running program slowly and build gradually. This is not a 0 to sixty program your first time out. If you have foot or ankle concerns before you begin, consult with Dr. Teichman. His expertise can guide you on a conditioning plan and get you focused on the next step. Call (610) 432-9593 for an appointment. Michelle Obama has also been doing a lot to get kids active, I believe she has a whole website dedicated to her campaign on getting kids moving.